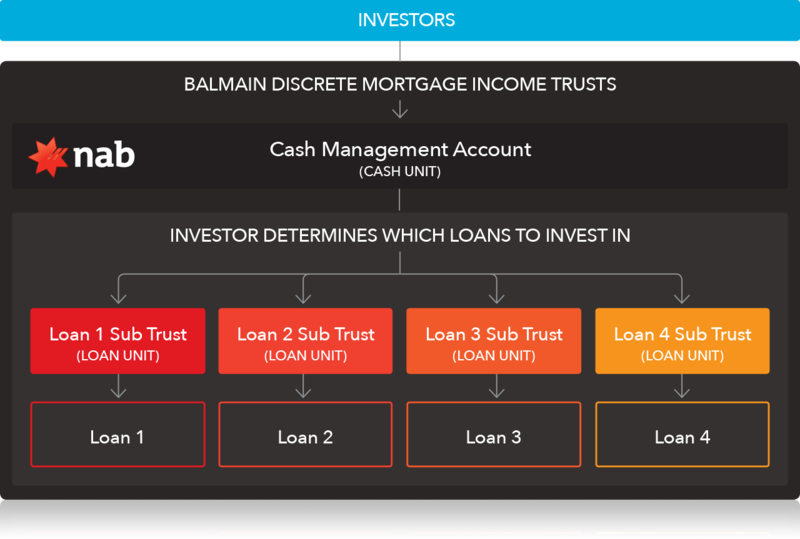 The Balmain Discrete Mortgage Income Trusts issue two classes of Units. Cash Units which are invested in a NAB Cash Management Account and provide investors with access to Loan Units, each of which invests in individual registered first mortgage loans secured over commercial property in Australia. Once invested in Cash Units investors are entitled (but not obligated) to invest in specific and distinct commercial property loans via an investment in discrete classes of Loan Unit, each Loan Unit contains one commercial loan. Note investors must first invest a minimum of $50,000 in Cash Units before they can consider investing in Loan Units. The design of the Trust and individual Sub Trusts allows you to choose and control your investment portfolio by allowing you to elect the underlying Loan Unit investment that best suits your particular needs. There are no fees charged to investors on Cash Units. Whilst invested in Loan Units investors are charged a fee but 50% of the fee is deferred and only paid to the Manager once an investor has received the full return of their capital plus the interest paid at the subscribed target return.